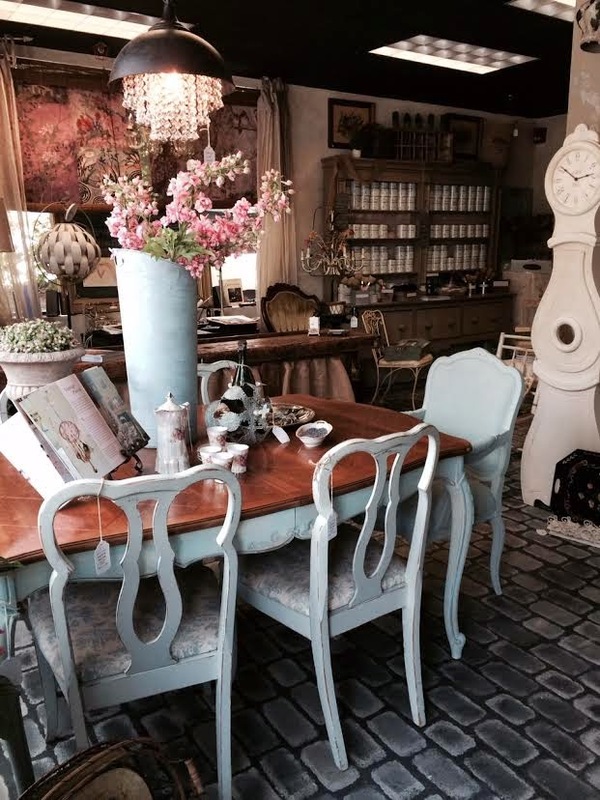 We do a lot of custom paint jobs at Maison Decor. and often you will find pieces in great condition, but you just don't like the color. and they plan to use them in their dining room at the ends of the table. 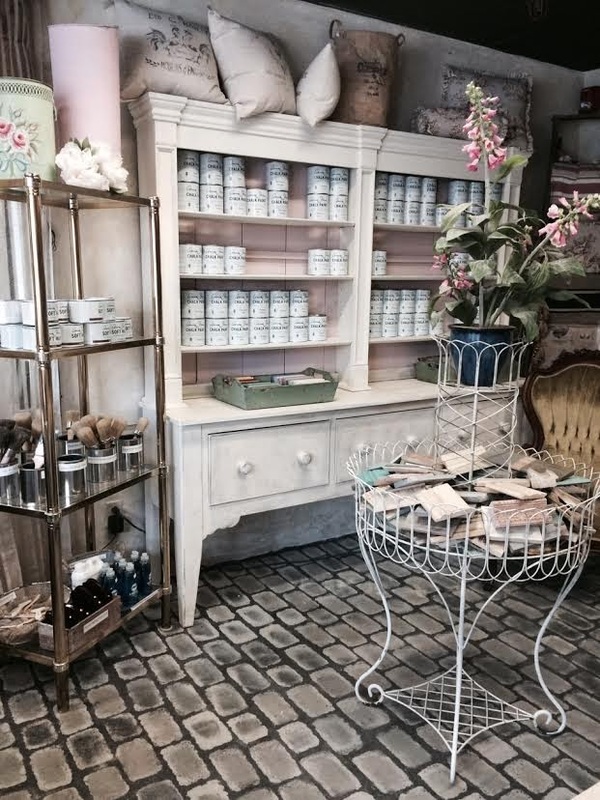 stepped in....with our Annie Sloan paint brushes and Chalk Paint! of color. 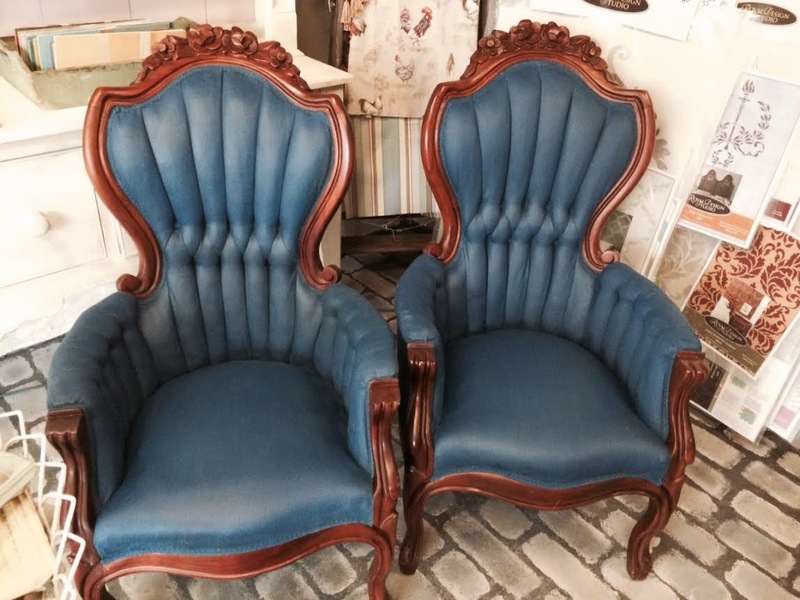 These chairs were going from chartreuse green to Napoleonic Blue. it this way, so as not to overburden the fabric with thick layer of paint. This will help reduce any cracking that a heavy layer of paint could produce. with the direction with the nap, so it lays down. 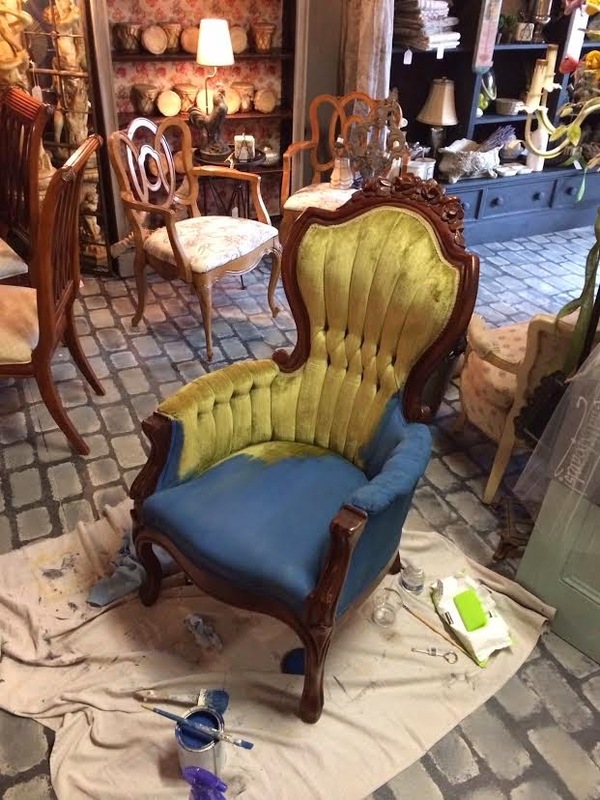 In this photo you can see the first coat has been applied to the chair on the left. sandpaper. Then it is time to do the second coat. This photo shows the second coat has been applied. green color showing through anymore. If there is, do another layer, let dry and then sand again. its time to wax it! Yes~you will wax your fabric. But this is going to be a little bit different than waxing a piece of furniture. so it is light and will not overburden the fabric. it using one of our wax brushes. Just rub it all over the fabric, wiping off the excess with a clean lint free cloth. and wipe it back, one section at a time. It will leave the fabric looking and feeling like leather! all set to take their place at the head of the table! less expensive than a trip to the upholsterer! and you will not have paint or wax coming off on your behind. over a year now. Its true, Annie's paint is really special. 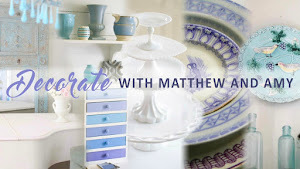 Its been a long time since I have blogged, so I have a lot to share. We have been busy little bees in our shops! 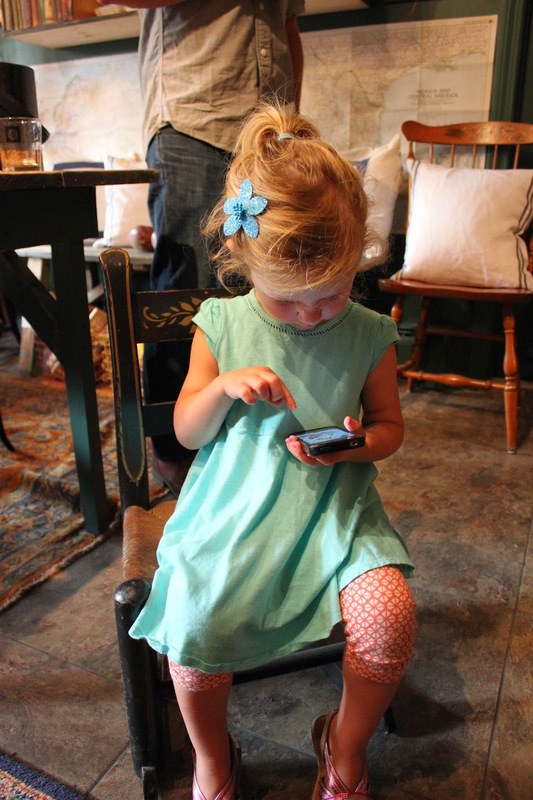 why there has been little time for blogging. 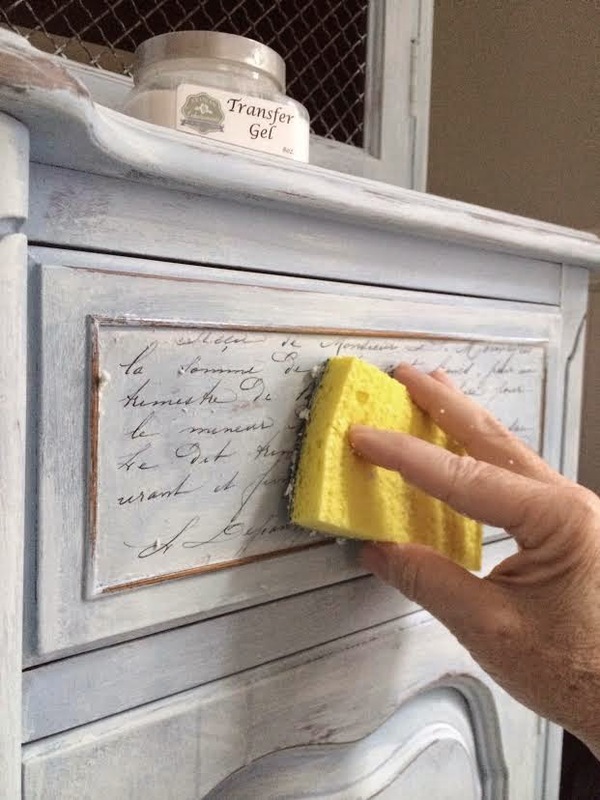 make it over using Chalk Paint. I love how it looks now. look a little bit more special and custom. Here is Gina going at it. 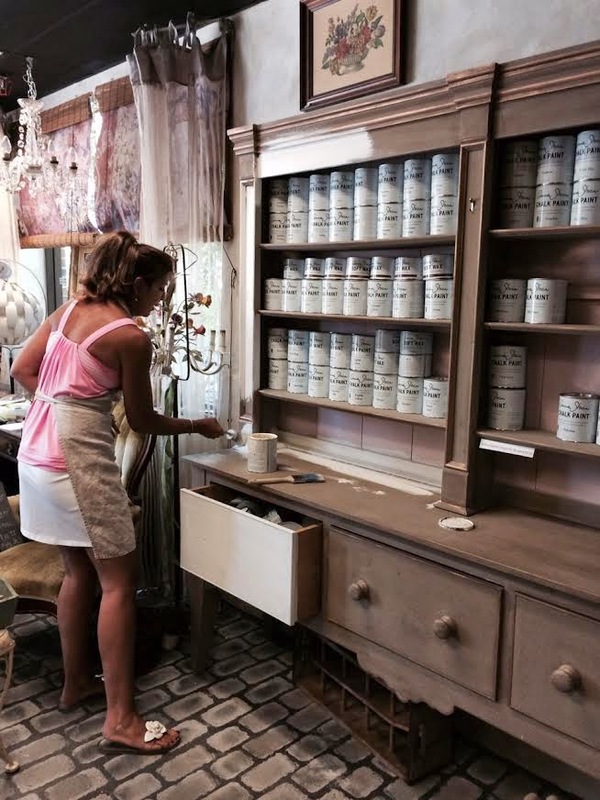 It took her about one hour to do the entire cabinet. and clear wax and a touch of dark wax to finish it up. 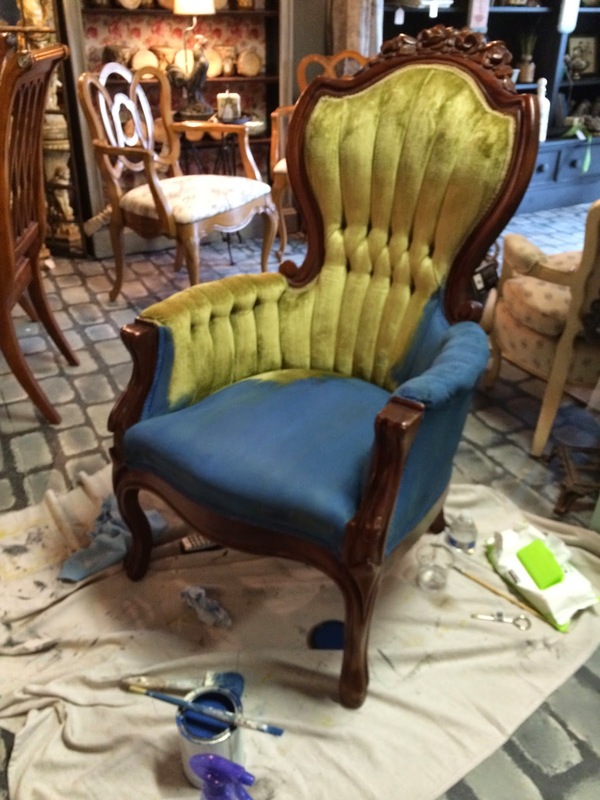 They were chartreuse velvet chairs and the client wanted them in a rich royal blue. of the paint on the fabric. or between any folds. Annie's paint brush is great for this! This photo shows the first coat completed on the left. See how you can still see bits of green coloration coming through the blue? with 500 grit with the nap, then wax with a 50/50 mix of Annie's clear wax and mineral spirits. The resulting feel of the fabric will be like leather. I will show the waxed chairs next time I post. In other big news for our little family business, Justin's shop is finally OPEN!!!! 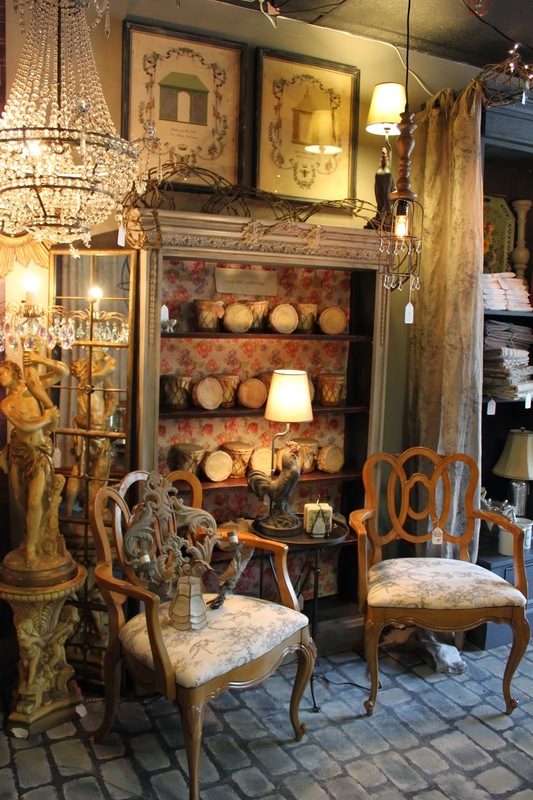 Here is a shot of his Boston neighborhood shop. Little iron garden fencing surrounds his store. Its so cute and quaint looking. Its on the corner of a busy street and has great visibility. 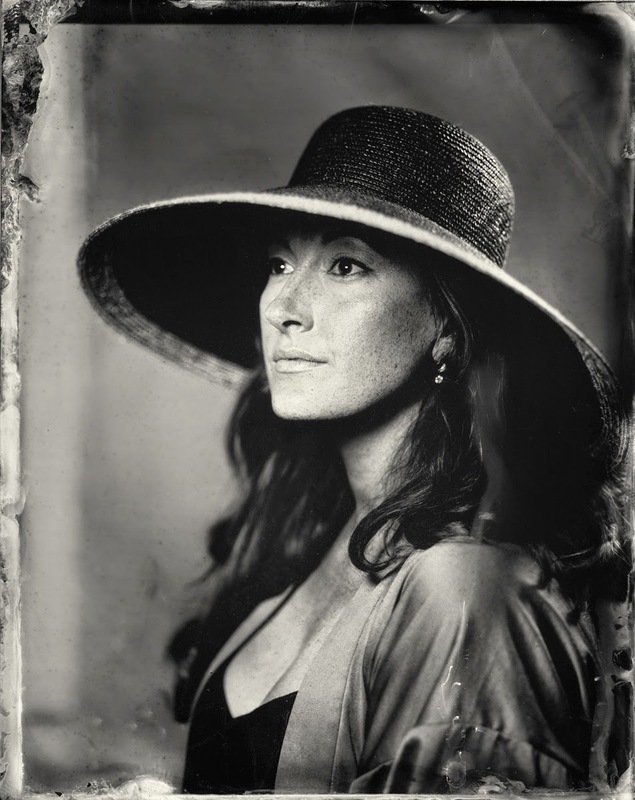 We hosted an event last Friday night, a Tintype Portraiture Event with itinerant traveling photographer Giles Clement, from Oregon. It was a smashing success! Follow along with a few pics below as I show off bits of the event. As I walked in the doors, the place was already a beehive of activity. Giles had set up a mini studio in the rear of the store. pouring this solution over the piece of tin that will eventually hold the image. Its super fascinating to watch in person. This couple is about to get their picture taken. Here is Colin posing for his portrait. too, so it was three generations. Pretty incredible. And you only get one shot, its not like digital where it can be redone or fooled around with~Giles was great at capturing your group at the exact moment. I watched him getting kids and dogs and groups...all with beautiful results! The tricky part about groups is that the camera focuses on one plane, so Justin reads a bit darker being in the back. Even my dad looks darker in the front, while Colin and I are lighter. Very interesting process. You watch it develop right in a tub of solution before your very eyes. This is Justin's portrait. So handsome and his eyes are just killer in this medium. 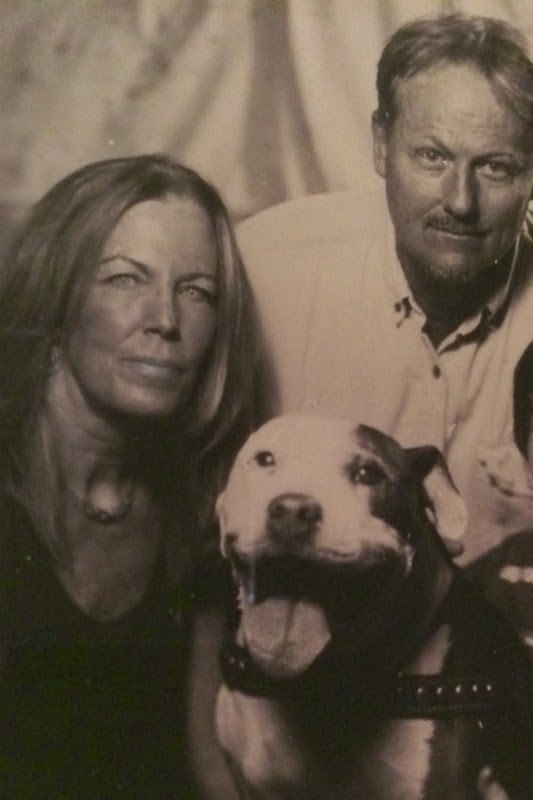 We brought Dillon in for the event as we wanted a true family portrait lol! inside to see what the hubbub was all about. bench, then Mr. Maison Decor had to scrunch down to be included in the shot. Dillon was busy looking all around, and so it's amazing that Giles captured him looking right at the camera! 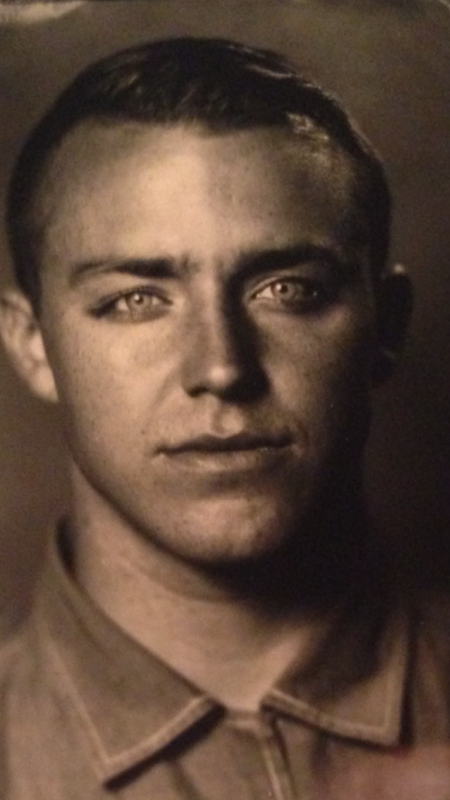 I think tintype is why the phrase "capture" was invented for photography. So the party and event at Pioneer Goods was a bit hit! and supported Pioneer and Giles Clement. 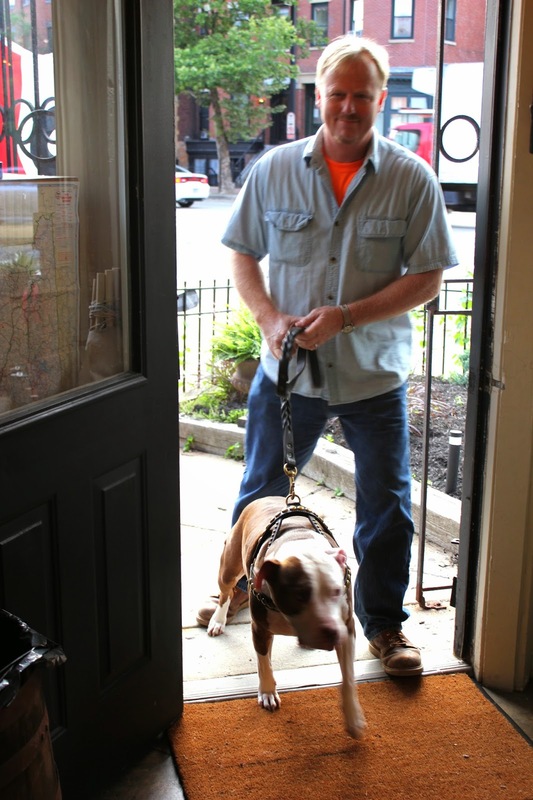 Small businesses rule!! and now they will have portraits that will last a lifetime and more. 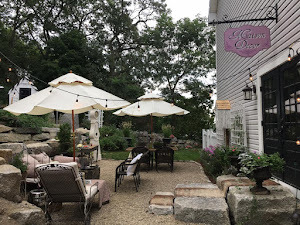 764 Tremont Street if you would like to visit. 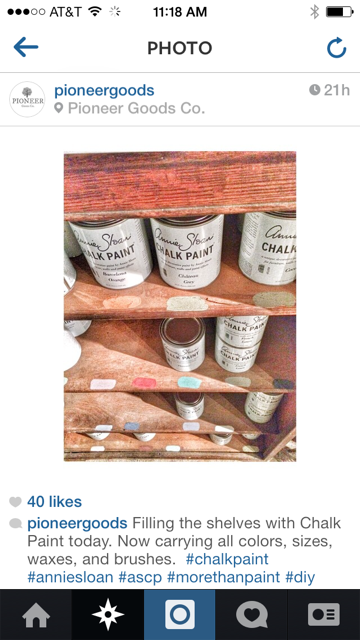 Annie Sloan Stockist and we just stocked up on Chalk Paint supplies. outstanding job on getting clocks hand finished and shipped out to our clients. 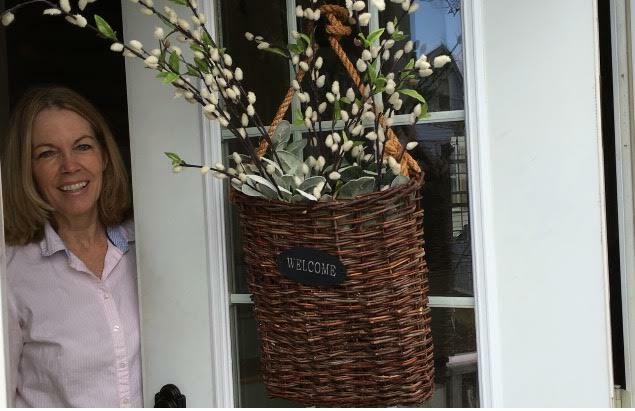 Here is one in a Rhode Island home, photo courtesy of its new owner. and we are excited people are loving them as much as we are! one in our shop as we need to send them out as soon as they are finished. 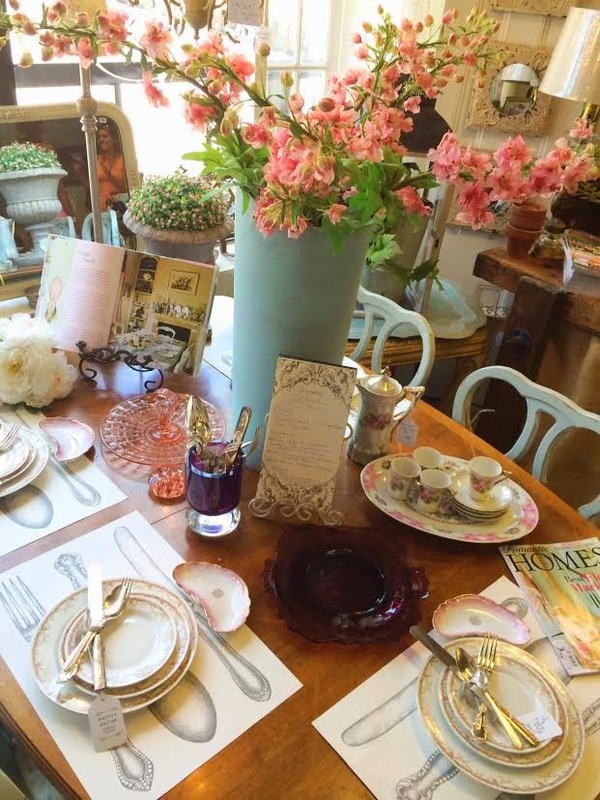 We had fun putting together a garden party dinner table setting in Reading. Mix your vintage tablewares with modern paper cutlery placemats that we carry. How fun is this? 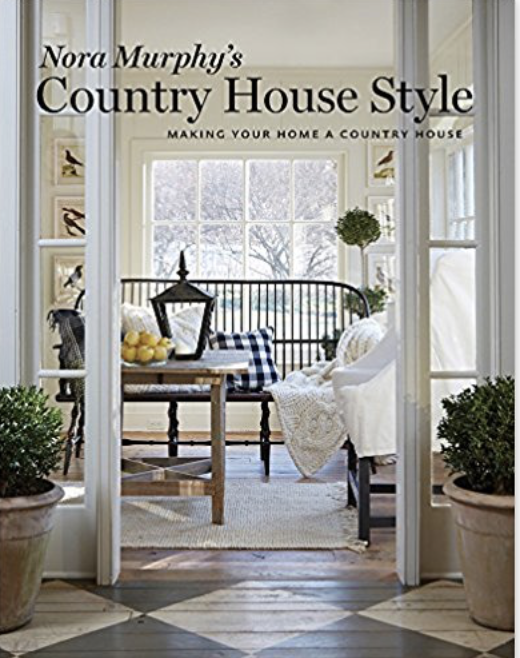 Its charming without being too granny. Here are a few pics of a few more displays. for a refreshing and fun shopping experience. how many times we hear, "it looks so different in here"! 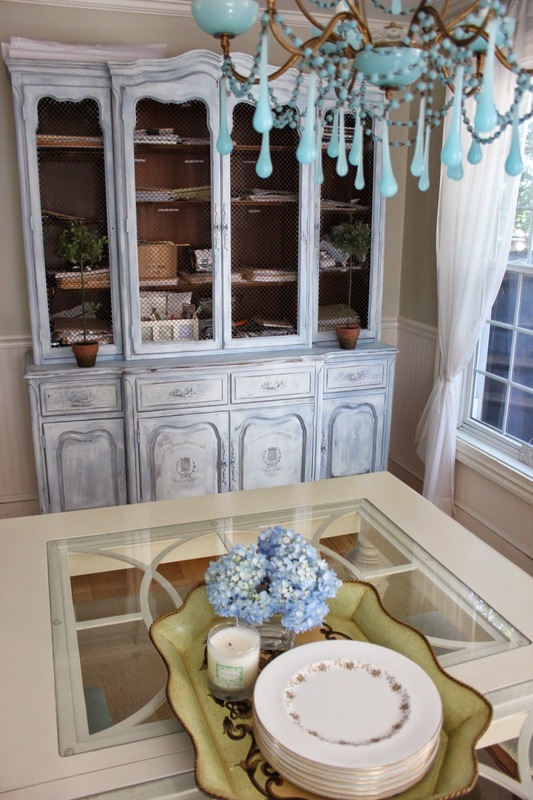 Our vignettes and accent pieces are ever changing and sometimes sell the day we put them out. 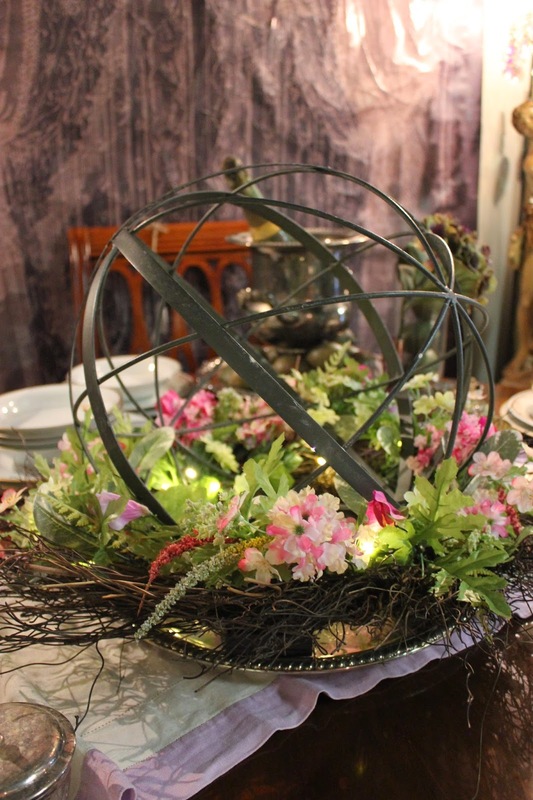 using a HomeGoods metal orb with a HomeGoods floral wreath that has tiny little lights woven into the wreath with a battery pack. I put them together on a vintage silver tray for a summery centerpiece. Imagine changing it out with a twig wreath for the fall and some mini pumpkins tucked inside the orb. And then again at Christmas, refresh with some greenery cut from Balsam. So easy to do and not a big expense either. 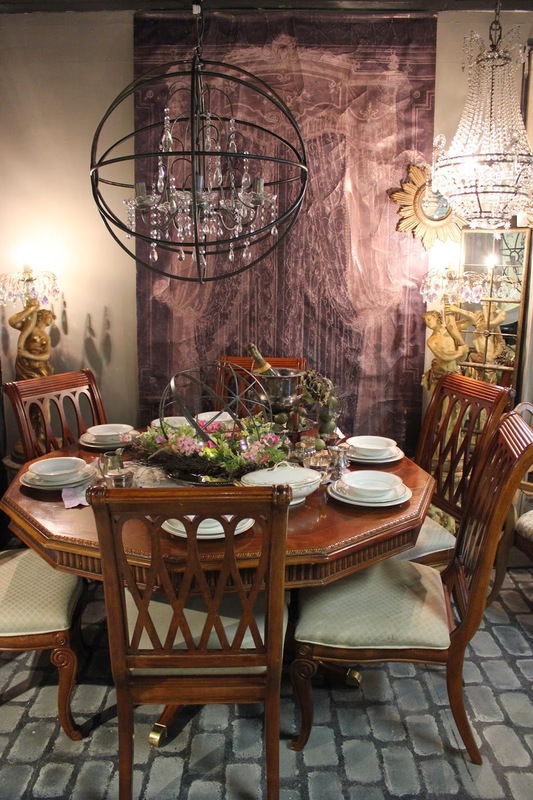 We have this great dining room set of 6 chairs and an octagonal table. most people love the idea of sitting at a round table. 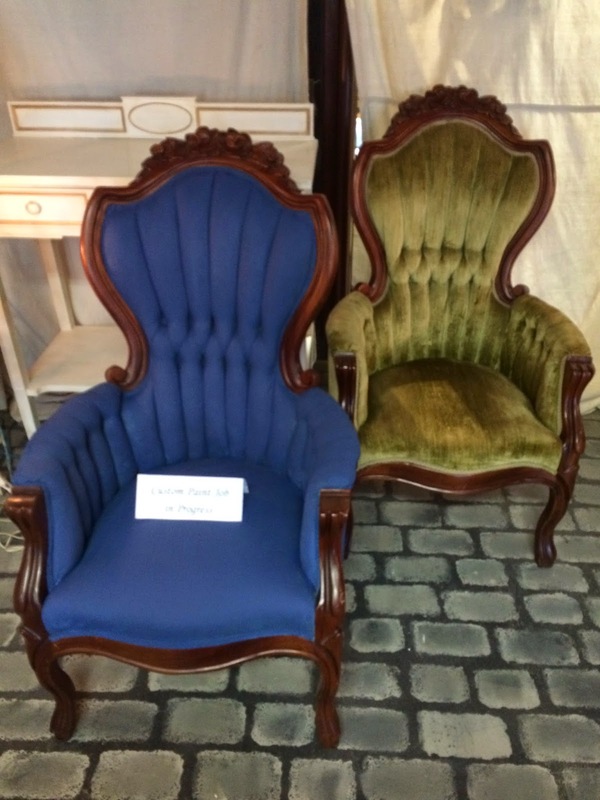 We post our furniture online and you will see these pieces with their pricing there. 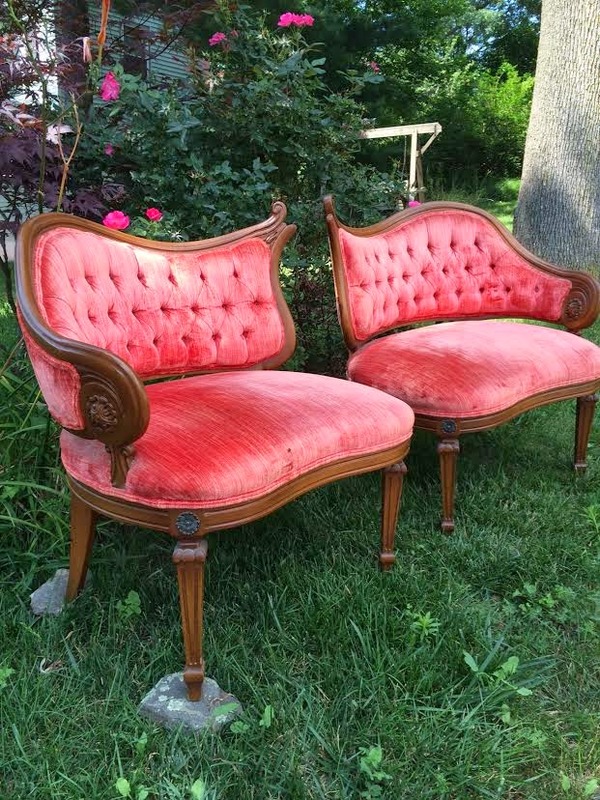 watermelon pink velvet chairs. OMG, I LOVE these chairs!! maybe its just me that loves them. 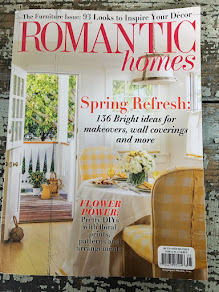 Note: This post is partially sponsored by HomeGoods as part of my participation in their Pinterest Designer board, Happy by Design. Link above. 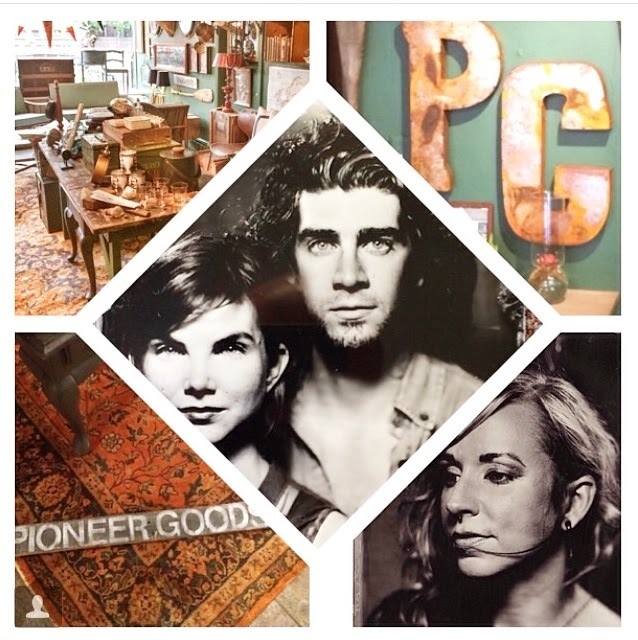 Pioneer Goods next Friday night! 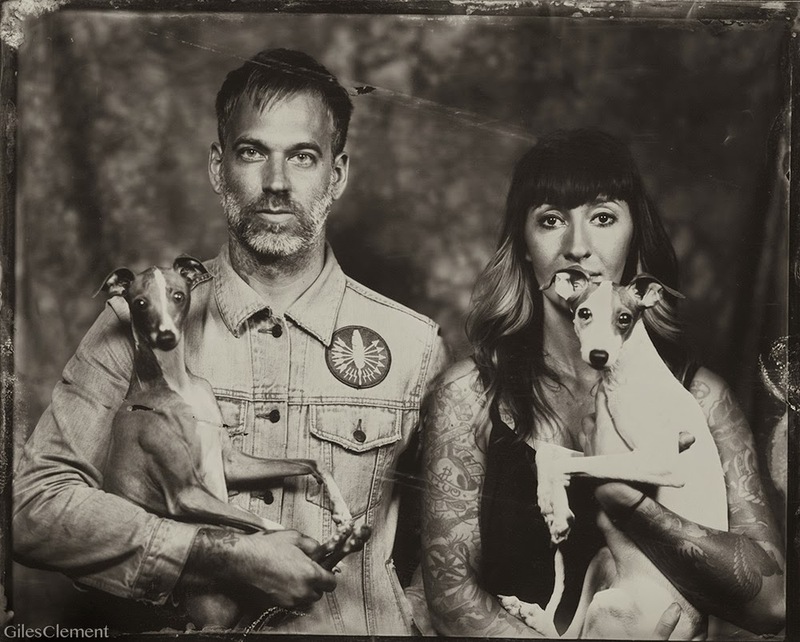 In the tradition of artists and tradesmen of generations past, portrait photographer Giles Clement is taking his studio on the road. Clement uses the tintype method of photography to create unique silver images on sheets of black metal. Tintyping was popular in the late 1800’s, but was quickly abandoned as less difficult and more reliable methods of portraiture were invented. Clement’s camera equipment is antique – some of it more than 160 years old. In harmony with old methods and equipment, he uses modern lighting and technologies to capture the faces, and often the souls, of a new generation of artists, inventors and pioneers. 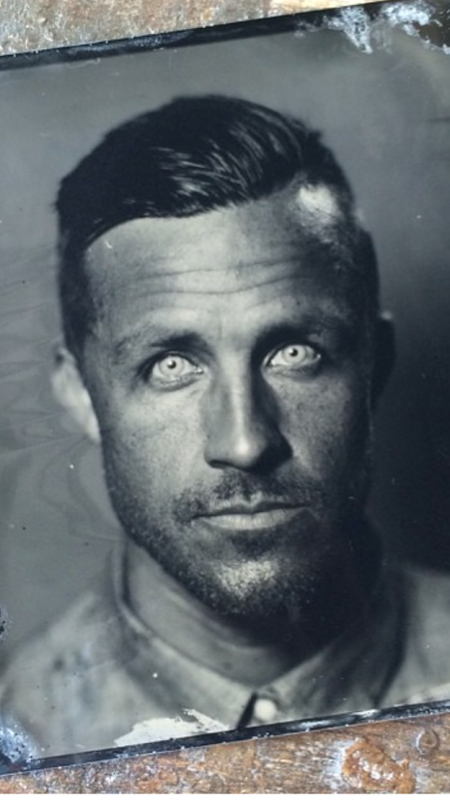 He will be stopping through Boston on July 18th and is being hosted by Pioneer Goods for an evening of tintype portraiture. 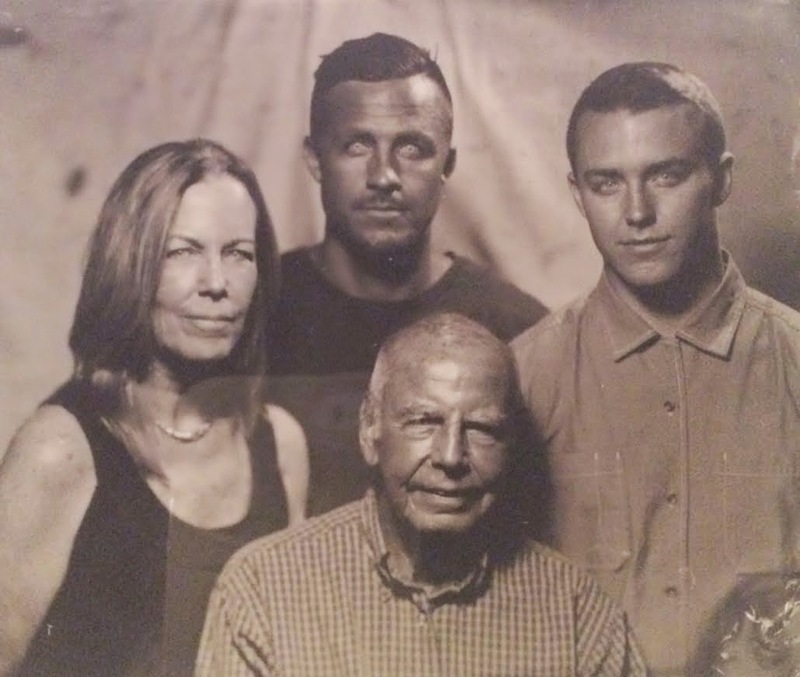 We invite you to join us from 6-9pm and to have your portrait taken in the way of your great grandparents. 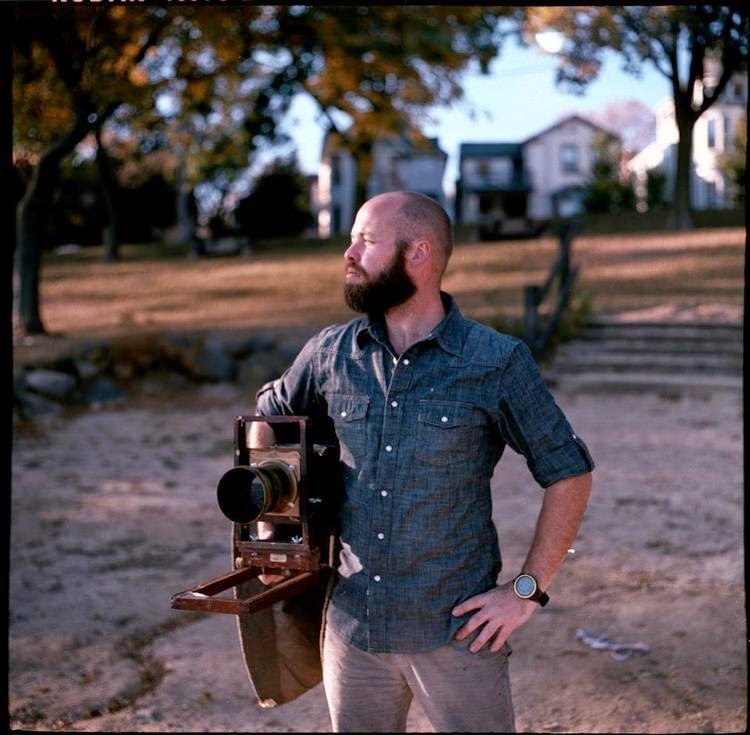 Clement will be taking 4x5 inch tintypes for the price of $50. Each plate will be carefully rinsed, scanned into a digital file and then ready for pick up the following day at Pioneer. 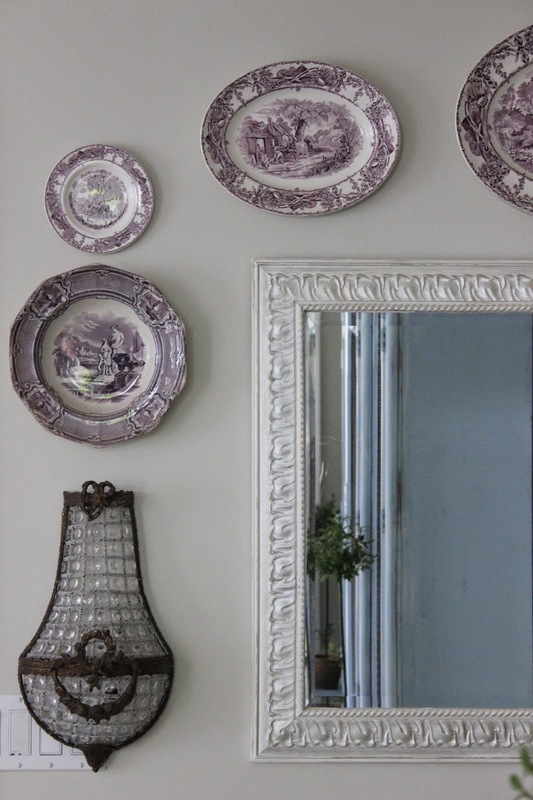 The plates themselves will last for hundreds of years and are a great way to capture yourself in a timeless and beautiful way. 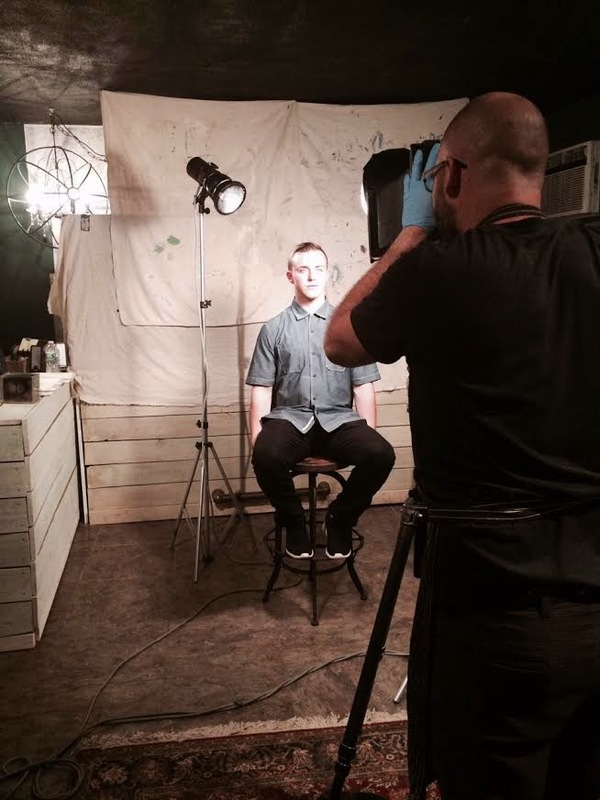 get your portrait done, old school style! don't leave him at home. 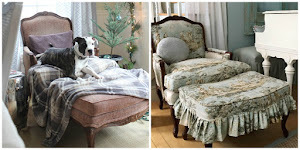 How to embellish your furniture with graphics using a transfer method. The drawers on the cabinet have a french script. 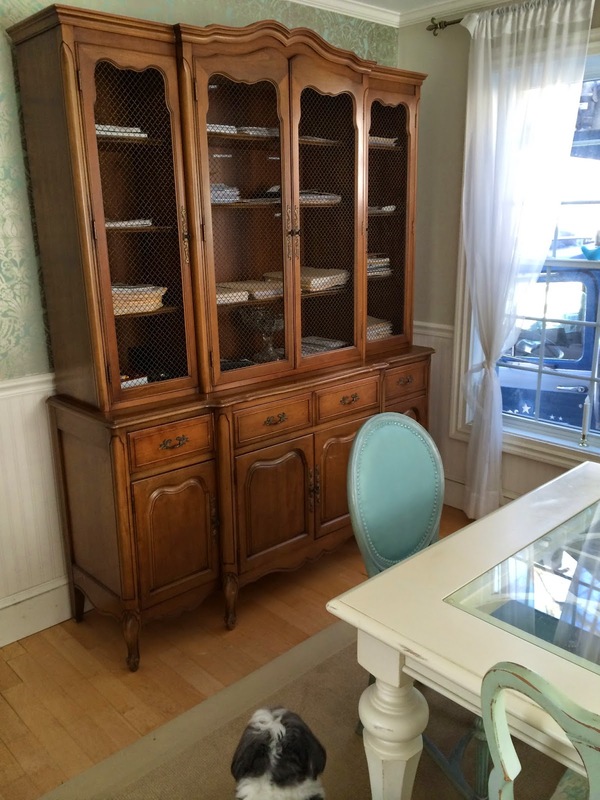 We use this dining room cabinet to store all of our day to day bills and papers. This is the before photo of our painted cabinet. 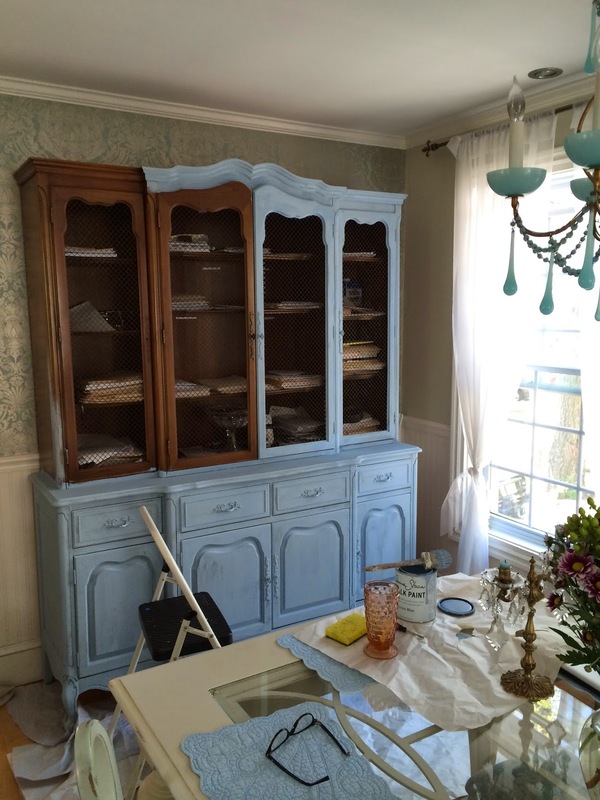 I used Chalk Paint by Annie Sloan for the first coat in the color Louis Blue. same blue lightened with Pure White. detail on the bottom of the cabinet. 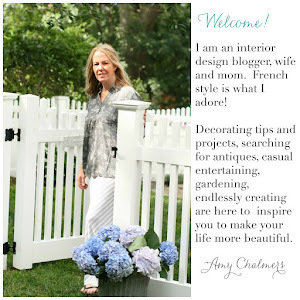 She has free graphics and you can print using a laser jet printer. Next apply the graphics with Artisan Enhancements Transfer Gel or similar product. with a damp scrubby sponge and the graphics are revealed! By lightly scrubbing off the paper, the image will be seen. The graphics float on the gel base that you used to "glue" the paper in position. Its pretty easy and the results speak for themselves. decorative image and more font for the center two cabinet fronts. 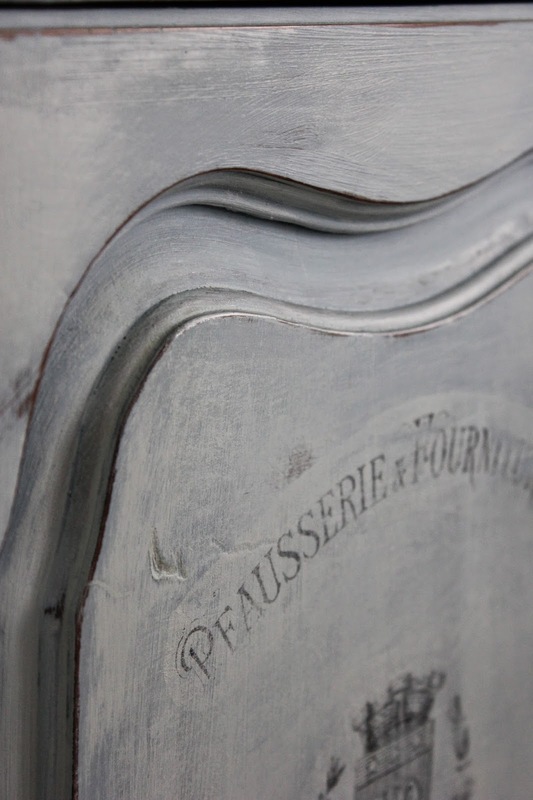 Highlights of Silver Gilder Paste around the edges add a touch of glimmer. 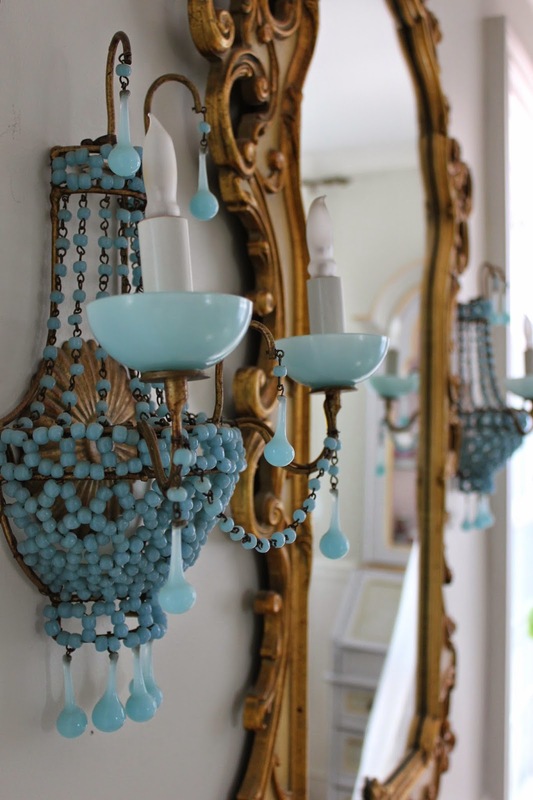 This room has a mix of silver and gold and different shades of blue. 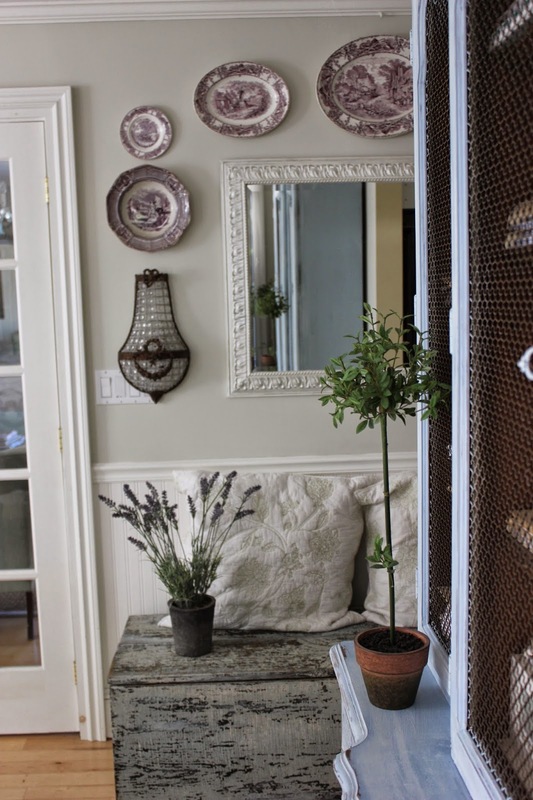 to find storage that works, and has both a purpose as well as looking pretty. 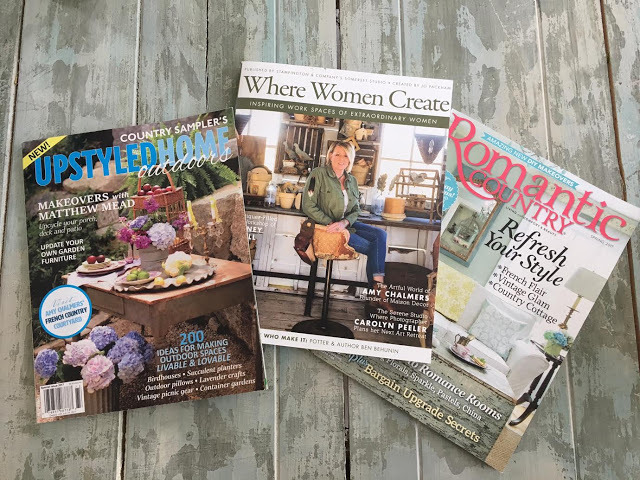 how you can make these pieces work for you and your home. dining room a place of order once again!